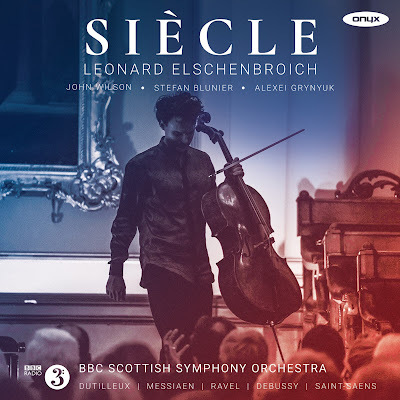 On previous discs, cellist Leonard Elschenbroich has shown interest in exploring thematic and cultural links between works, a disc last year on Onyx explored Kabalevsky and Prokofiev's reactions to life under Soviet rule (see my review). That disc mixed chamber pieces and concertos, and on this new disc from Elschenbroich on Onyx Classics there is a similar mix. He starts with Henri Dutilleux's 1967-70 Cello Concerto 'Tout un monde lointain...' with the BBC Scottish Symphony Orchestra and John Wilson, and ends with Camille Saint-Saens' 1872 Cello Concerto No. 1 in A minor op.33 with the BBC Scottish Symphony Orchestra and Stefan Blunier. Between these Elschenbroich is joined by pianist Alexei Grynyuk to trace the century of French cello music, drawing a line from Dutilleux to Saint-Saens which includes the 'Louange a L'Eternite de Jesus' from Olivier Messiaen's 1940 Quatuor pour la fin du temps, Claude Debussy's 1915 Sonata in D minor for cello & piano, and Maurice Ravel's 1907 Piece en forme d'habanera. It makes for fascinating and engrossing listening, especially as we start with the Dutilleux and move backwards to end with the Saint-Saens. Excellent programming in that the mystical translucence of Dutilleux gradually gives way to the showy brilliance of Saint-Saens, but it means that we hear the links between the works in a new way. Dutilleux's concerto was written for Rostropovich and has Beaudelaire links (Dutilleux wrote it after dropping out of a projected ballet based on Les Fleurs du mal), but it seems that the titles of the movements were added afterwards so we have to take them as being general indications of mood rather than being strictly programmatic. The work is in five movements, reflecting an interest in Bartok's arch structure and, in terms of musical material. the influences of Bartok (particularly the Night Music) and Walton (his cello concerto premiered in 1956, written for another Russian cellist, Piatigorsky). But Dutilleux's own distinctive voice remains paramount, in his fascination for colour and texture with the large orchestra used sparingly. Elschenbroich brings out the lyrical, melancholy of the solo part, allowing the opening Enigme to develop from a questioning so recitative to vibrantly impassioned dialogue with the orchestra. The spare and melancholic Regard has light orchestral support for the intense solo part, which Elschenbroich again makes rather questioning. This leads directly to Houles which is strenuous and dramatic though even here, the music evaporates at the end and in Miroirs we return to a singing cantilena with spare accompaniment. It is here that the hints of Bartok's Night Music occur the strongest. Finally, Hymne creates a series of magical textures but combines them with a strenuous cello part. Elschenbroich really brings out the singing quality of the solo writing, making light of the more taxing moments. It is quite a present performance, you could imagine something more mystical, but this is a very vibrant take on one of the 20th centuries most fascinating concertos and Elschenbroich is finely partnered by the BBC Scottish Symphony Orchestra and John Wilson, producing some lovely translucent textures. Hearing the 'Louange a l'Eternite de Jesus' from Messiaen's Quatuor pour la fin du temps in this context, brings out the sense of a solo cello cantilena over minimal support (Alexei Grynyuk's piano). Elschenbroich plays with lovely tone and sense of line, with remarkable sustained intensity over the breadth of the piece. We leap back 25 years for Debussy's Cello Sonata, in its way an equally radical work. There is much that is remarkable about the piece, despite Debussy's espousal of classical forms and hearing the fantastical and angry middle movement you sense many of the 20th century's musical developments are not far away. Elschenbroich and Grynyuk being in richly romantic vein, with warm tone from both. Whilst Elschenbroich's playing is beautifully fluid and surprisingly delicate at times, there is also a measured quality to the performance. By contrast the 'Serenade' (which Debussy thought of subtitling 'Pierrot Angry with the Moon') was impulsive, and almost edgy. There was a vibrant and rather Spanish feel to the Finale, in the way the cello line was supported by rhythm in the piano, but there was vitality and skittishness to. The Spanish element came out to the fore in Ravel's Piece en forme de habanera, originally written for bass voice and piano. Here Elschenbroich played with real elegance, finely supported by Grynyuk. The opening of Saint-Saens' Cello Concerto No. 1 positively exploded into the air, with a vibrant and dynamic performance from Elschenbroich, the BBC Scottish Symphony Orchestra and Stefan Blunier. But Elschenbroich ensured that there was also an elegant fluidity to his phrasing, with plenty of poetry too. The middle section came out very much as an elegant dance with the cello singing over the orchestra, before the final section returned to the vibrant dynamism of the opening. Elschenbroich brought a haunting melancholy to the more lyrical episodes, but we had a really vibrant finale. This is one of those programmes where you might pick other recordings for individual works, Rostropovich recorded the Dutilleux, and there are many versions of the Saint-Saens from Tortelier to Jacqueline Du Pre. But Elschenbroich and his collaborators, bring a sense of intelligent programming to the whole disc making the connections between the works and creating an intriguing whole which is a rather satisfying programme.